This is a depressing film. It’s about a poor farmer family living in Tohoku (northeast part of Japan) and its daughter’s love for their horses. Her parents see the horses as a source of income, while for her, they are her companion. Of course the parents mindlessly try to sell a young horse to get some immediate cash, and in protest, she goes to work for a spinning mill to earn enough money to buy the horse back. Well, she couldn’t raise money, and the young horse is sold off as a warhorse. To us, this is all the more depressing, because we know how they ended their lives. 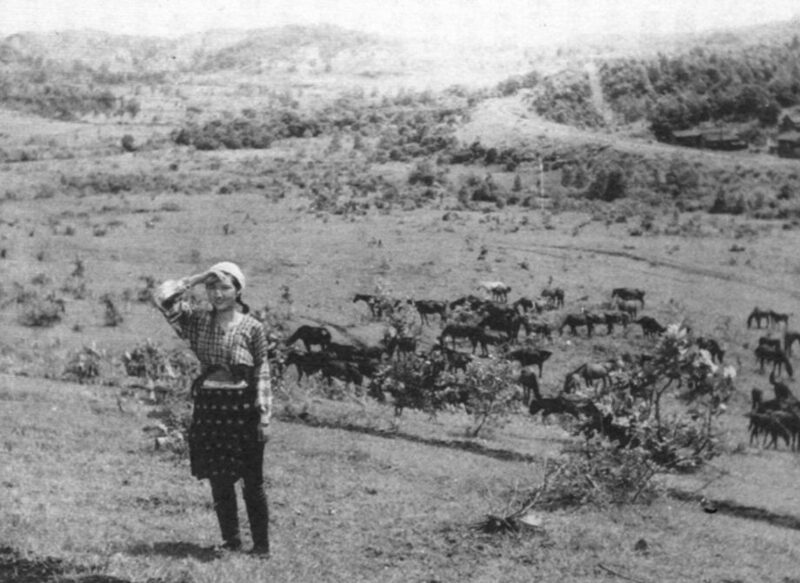 Most of the warhorses have perished in far-off places, – Korea, Manchukuo, China, Indonesia … They have probably perished from exhaustion, undernourishment, starvation, disease … And they must have been abandoned in the barren war fields. I have read a couple of accounts on the warhorses during the Fifteen-year war, and it is more depressing to know that some of the soldiers actually cared. They felt compassion for the warhorses because they themselves were from poor farming families, and they knew how much care and efforts were spent on these horses by the fellow farmers. Some of the soldiers tried to save the horses as much as possible as if they were human comrades. But when they themselves were starving and dying from diseases, there was not much they could do. This film wasn’t supposed to be that depressing at the time, I think. It was produced as a series of lyrical aquarelle, brushing the colors of seasons on sprite landscapes. Though it might have made audience cry during the heart-wrenching scene of the last farewell between the teenage girl and her horse, the undeniable undertone of patriotism supports the frame. 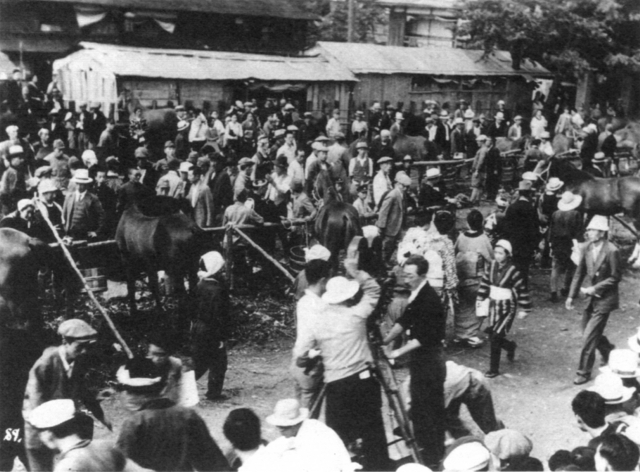 The horse was acquired by the government at the generous prices way higher than the market and sent off with a little Japanese flag on its back. The farmers were ecstatic and thankful of generosity of eminent government officials, while they were supposed to be satisfied with little consolation that their product were going to be serving for the country. But the opening title of the film tells us all. It calls warhorses “living weapons”. The film was a big pet project for the director, Kajiro Yamamoto. I think the very beginning of the idea occurred to me when we went to Shima Onsen (Gunma prefecture) to write up the screenplay for “Roppa the Father (ロッパのおとうちゃん, 1938)”. Nothing better to do, I was listening to the radio in the hall. There was a live broadcast of the horse auction from Morioka. Listening to neigh and noise of the horses, voices of auctioneers, I wondered how these sellers felt joys and sorrows. But the studio, Toho, didn’t think much of it. “No thanks, we are not a zoo. We are not going to make money showing animals.” So, Yamamoto brought the screenplay to Horse Administration Branch in Military Administration Bureau and convinced the military officials to influence the studio. It worked. A few days later, there was a notice from the Ministry of Army, signed by General Hideki Tojo, to produce the film. The film took almost two years to complete. Yamamoto preferred the location shooting for its semi-documentary look, and he was directing Roppa Furukawa’s comedy vehicles in parallel. 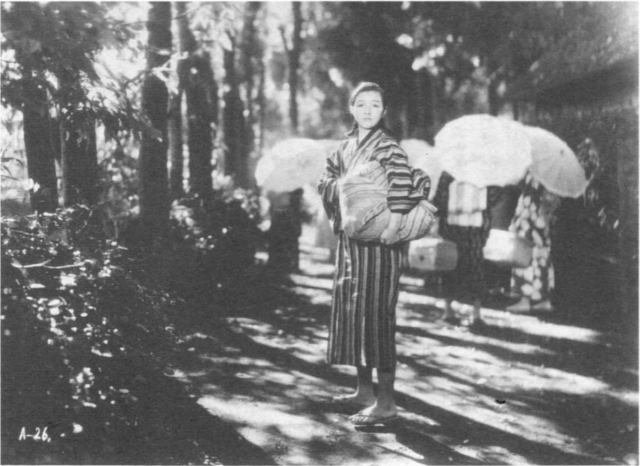 According to Hideko Takamine, who played Ine, the main character of the film, the most of the location materials were directed by the assistant director, Akira Kurosawa. “It’s Kuro’s film”, Takamine said. Horse (1941) during production. The guy wearing a funny white hat at the right is probabaly Akira Kurosawa. One of the reasons why it took so long was to get an authentic background scenery. Yamamoto remarked “Japanese can tell the exact time of the year, just looking at how the rice is growing in the rice field in the background.” So he avoided “cheating” while filming the farming village. Once you made a pact with a devil, you can’t get away with a free lunch. 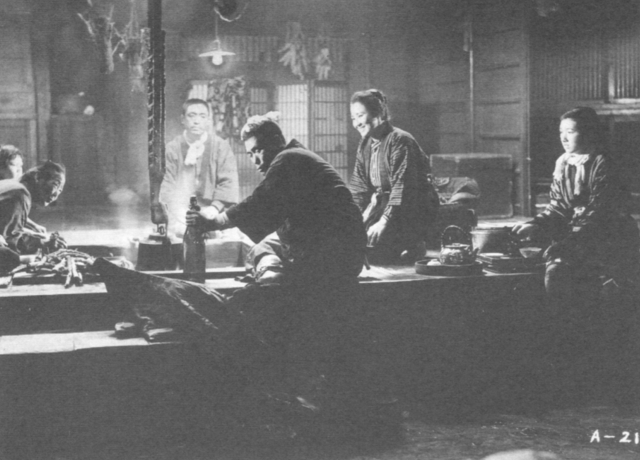 According to Akira Kurosawa, the official at the Horse Administration Branch demanded the cut in the film. Near the end of the film, during the auction where Ine’s young horse is being auctioned off, the farmers are celebrating with drinks and singing local folk songs. Ine, who is so devastated by the separation with her horse, listens to the melancholy song in the background, feeling the deepest loss. One of the high-ranking officials didn’t like the scene. Because these farmers are breaking the regulation against the drinking during daytime. Kurosawa blew his already-short-fuse. The scene was in the script. Not only that, Colonel Mabuchi from the Horse Administration Branch was there during the shooting. This tracking shot was so difficult, it was a miracle we got that scene. …. And what is this cutting business at this late in production! I refused. The situation got really worse because the Army was considered invincible and Colonel Mabuchi had a brain made of stone. Mr. Yamamoto and Mr. Morita (the producer) were thinking the cut was unavoidable, but I wasn’t flinching. I just couldn’t stand that guy’s arrogant attitude. Then one night, Morita took Kurosawa to Colonel Mabuchi’s home, to ‘discuss the matter’. There is nothing to discuss, Kurosawa said. There wasn’t. Kurosawa didn’t back off, neither did Colonel Mabuchi. Morita quietly drank cups after cups of sake. Then, suddenly, Colonel Mabuchi with his both hands on the floor, said “please cut the scene, would you?” Kurosawa agreed. It was just a matter of pride. Because the whole production took almost two years, it was neither feasible nor economical to assign only one cinematographer for the entire film. There were four different cinematographers, each assigned to one of the seasons. Hiromitsu Karasawa did spring, Akira Mimura did summer, Hiroshi Suzuki did autumn and Takeo Ito finished winter. Akira Mimura was responsible for the total quality of the cinematography. Because each cinematographer had his own style and his own visual concept, it was almost impossible to achieve the unified look throughout the film. Mimura analyzed each cinematographer’s style and did a lot of additional shooting on his own to compensate the differences. Because of this experience, for Yamamoto’s next film, “The War at Sea from Hawaii to Malaya (ハワイ・マレー沖海戦, 1942)”, Mimura planned the coordination of multiple cinematographers in advance, down to minute details of shooting parameters. The use of multiple cameras and camera angles was already in practice. The last scene of the film is just devastating. Ine’s young horse is taken off to the military station by her father. Ine, sending off her friend, listens to the sound of hooves. The sound of hooves diminishing. She put her hand on her ear to listen to the last sound of it. She listens. We listen. The last sound of the little young horse.